Normally you will find that basement staircase is designed with two walls that go all the way down the staircase. In order to open up a basement staircase is by removing one of the walls so that you would be able to view the basement once you enter the area on the stairs. The position of the staircase is usually against the side of your exterior wall on one side while a non-load-bearing wall on its opposite side. If you are not sure whether the wall is a load-bearing or not you should seek advice from a building inspector to help you out in checking the wall. When it comes to removing wall, you will definitely end up with lots of mess and dusty room where you need to do lot of cleaning once you finished the project. 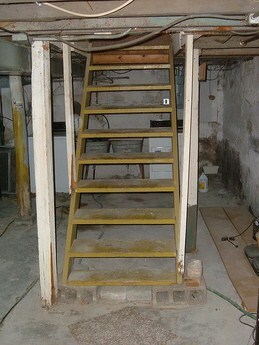 Below are some of the steps that you should take in order to get rid of walls for opening up a basement staircase. First thing that you need do is to shut off your power supply to the wall that you want to remove if there is any. You should disconnect your circuit breaker so that the power is disconnected to the whole room that you are working. You must also make a temporary lighting by using an extension cord connected to the upper level of your house before you proceed to disconnect your circuit breaker to the basement room. Always protect yourself by wearing gloves and eye mask for protection whenever you start to remove the wall in order to protect your hands and eyes from danger. Then, you need to lay down drop cloths on the floor beside the wall that decide to remove. Take a flat head screwdriver and remove all cover plates that you find from any outlets as well as light switches, along with junction boxes for the outlets and switches that are attached to your wall studs. If you notice any baseboard on the wall, you need to pry it away from the wall by using a small pry bar and hammer. Once you managed to pry away the baseboard, you would be able to view the location of the wall studs. If you still cannot locate it, you need to run a stud finder right across the wall before you can mark the stud locations on the wall using a pencil. Using a utility knife, you have to score through your drywall right at the middle of each of your stud. You also have to score lines across the wall before intersecting your stud scores with at least 4 feet up the entire height of your wall. By having these score lines, it will help you create lesser mess once you start to remove the drywall. Using a hammer, you need to punch a hole via the drywall right between the studs at one of the horizontal scored marks. When you already have a hole big enough to enable your hand to go through it, you need to start pulling your drywall away from the studs just by using your hand. Make sure to get rid of as much drywall as possible. Remember to avoid pulling out any of the electrical lines at the wall. You must remove the drywall screws using a cordless screwdriver or you can even use a drill with a Phillips head bit. If you feel it is necessary, you should pull all the screws using the hammer or pry bar. This technique helps you remove any of the remaining pieces of drywall left on the studs. You must also make sure to check whether there are any electrical lines and duct work beneath the area of your staircase. If you are not confident or do not have any knowledge about wiring, it is recommended you seek help from a qualified electrician to the job for you. You can consider using a half-wall for covering the side of your staircase whenever there is any duct work near the area. Before you start to cut through any of the studs, you should determine which one that you want to get rid of and which one that you want to keep. Sometimes it is advisable for you to keep a small wall right at the first few steps of your staircase. Duct work is not easy to remove and also will cost you a lot if you want to remove it to other location. The top of the studs need to be cut along with the ceiling where you can use a reciprocating saw. You need to ask a friend to hold the stud that you have cut that should meet up with the sill plate on the floor. Remember not to cut any of the studs which attach to the bottom of your staircase stringers. You can make use of a crowbar and hammer in order to pry the sill plate off your basement floor. The sill is a board measuring 2-by-4 inch that attached onto your basement floor. Finally, when you have finished removing the wall, you need to cleanup all the mess that you have made. If you have laid down drop clothes, it will be much easier for you to remove the debris from the wall. Once you have clear all the debris, you need to start clean up all the dust in the area and immediately so that the dust will not spread out to any of the room in the upper level. To seek proper advice from your building inspector from the local authority or contractor so that you can verify which wall has a load-bearing before you can proceed to remove the wall. You must also seek the help from a professional electrician before you start to remove or even re-route any of your electrical wires found on the wall. This entry was posted in Home Improvement on April 28, 2012 by Mike.